Director Shankar’s magnum opus 2.0 starring actors Rajinikanth and Akshay Kumar, is already a definite blockbuster at the box-office. The costliest ever film in India has made a record of earning Rs.120 crore in just its advance booking. That’s insanely high compared to any other movie in the past. It has also become the first ever Tamil film to cross the mark of 100 crore in advance booking. While there were two contenders seen as box-office champs in Amir Khan-Amitabh Bachchan’s Thugs of Hindostan and Rajinikanth-Akshay Kumar’s 2.0, now there’s only one. Because everyone knows what just happened with Thugs of Hindostan, as it’s turned out to be the biggest ever disasters at the box-office, in many years! It was a big disappointment for not only fans but critics too. 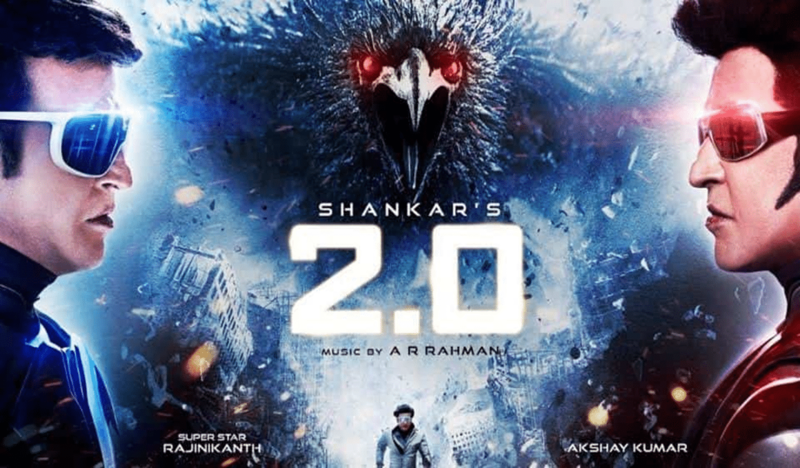 However, people are expecting very high from 2Point0 movie as its predecessor, Robot (or Enthiran in Tamil) was also a mega-hit, back in 2010. That film starred Rajinikanth opposite actress Aishwarya Rai Bachchan. Some rumors are even hinting that the upcoming sequel to Robot, may even break Baahubali 2: The Conclusion’s records also—well, that’s too early to say. But looking at the figures of its advance booking collection, then it may happen, only when the entire country falls for it as it did for Baahubali and then Baahubali 2 as well. Ramesh Bala tweeted about 2.0’s record earnings even before its release next week in the country. It will be interesting to see how 2.0 plays out till the time Shah Rukh Khan’s Zero comes out in late December. Zero has also attracted a lot of buzz while its trailer generated record views after being released on YouTube. Zero will also be the last big flick of 2018, and thus anticipations will be high too, especially from die-hard fans of Shah Rukh Khan. So, 2.0 will have a task of not only creating box-office magic but also set a new benchmark for future films too. Distributed by Lyca Productions, AA Productions, and Dharma Productions, and also starring Amy Jackson, 2.0 will be releasing next week on November 29th, 2018.